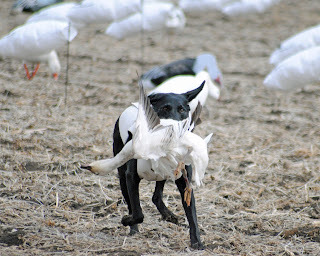 The best part about going out on a duck hunt has got to be watching the dogs work. When you’re using an older dog, watching them fetch and retrieve ducks is a thing of beauty. Younger dogs that don’t have as many miles and might lack the smooth style of their older companions, but they have an enthusiasm that’s contagious. If you’re going out on guided duck hunts and plan to bring your four legged hunting companion, there’s a few things you need to keep in mind. Talk to the organization handling the guided duck hunts and let them know your bringing your hunting dog. They’re probably not going to care, but giving them a heads up is polite, plus it might make a difference if they’re putting together a group of hunters based on resources. They will also let you know if the area where you’re going to be hunting could pose any health hazards to your animal and if you need to have your vet administer any additional vaccinations. It’s not reasonable to expect a dog who has done nothing but lay in the sun all day to be in any condition to suddenly go to Missouri and start hunting. You have to prepare them for the experience and make sure they’re ready and able to go. In addition to training them, you will also need to spend some time conditioning them which includes regular running and swimming. Getting your dog ready for Missouri’s duck hunting season takes time, don’t put it off until the last minute. Your dog might be great when they’re on a duck, and they might have a great work ethic, but when your on guided duck hunts that include other people and other dogs, there’s no excuse for your dog to behave badly. If you have an animal that’s unruly or who doesn’t get along with other people and dogs, you need to leave them at home and only use them when your hunting by yourself. When your in Missouri duck hunting and you have a partner who doesn’t have a dog, you should at least offer them the use of yours. You don’t have to hand over control of your dog to them, you still get to issue the commands, but your dog can fetch their ducks.